Comments: One of the first collectibles ever produced, this tankard was sculpted by Jim Rumph and released by California Originals. It reportedly is one of George Lucas' favorite collectors items, because he wanted to have a Wookiee mug to drink his coffee out of. 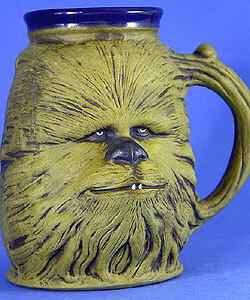 This particluar tankard was autographed by Peter Mayhew (Chewbacca) himself.